Our staff members can help your little ones develop and craft their own creativity through our creative arts activities. We simply provide them with art materials and allow them to do anything they want. We can also teach them to draw, color, and paint. 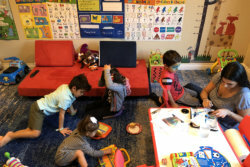 Rest assured that your child will be able to enhance their own skills in arts at our Childcare Center in Irvine, California.